Scottish Black Utility Kilt manufactured with heavy duty 100% drilled Poly Cotton Material . This traditional highland kilt is very useful for spring and summer highland games as well as for mountain hiking and camping. We use very Top Quality of cotton which is extremely soft and comfortable especially for long hours wearing. Hardware material of this kilt is of rust free material which gives it very long life. This design of Scottish wear has two long pockets one on each side which is very useful to carry daily accessories like cellphones, Keys, hunting tools and valets. Size of this style of kilt is not adjustable and is worn for one size only. If it is ordered for 32 it is for 32 only. Kindly use the standard procedure to select the accurate size of kilt. Traditionally and historically kilts are worn at or near belly button and waist size at this point are normally greater than normal jeans/ pants sizes. Before purchasing the kilts please measure your waist size at belly button in standard US inches. Utility kilt is manufactured for waist sizes between 32 and 50 with standard drop length of 24. Custom made facility are also available for some extra nominal charges. If kilts are ordered for women/ ladies please specify the desired drop length of the kilt, traditionally it varies between 16 and 18. 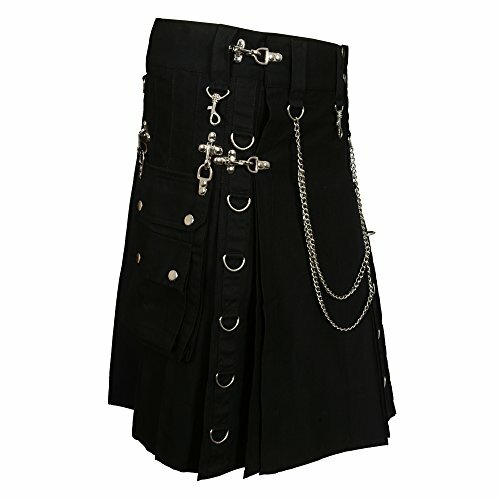 Men Scottish Black Fashion Kilt with Beautiful Silver Chains & Long Cargo Pockets Traditional Highland kilt is very useful for Spring & Summer Wedding Parties . We use very Supreme quality of Poly Cotton which is extremely soft and comfortable especially for long hours wearing. Rust Free Brass Hardware Material gives long life to Tactical Kilts. This design of Modern Kilt has two Pockets one on each side & useful to carry daily accessories like cellphones, Keys, hunting tools and valets. If you have any questions about this product by Scottish Designer, contact us by completing and submitting the form below. If you are looking for a specif part number, please include it with your message.